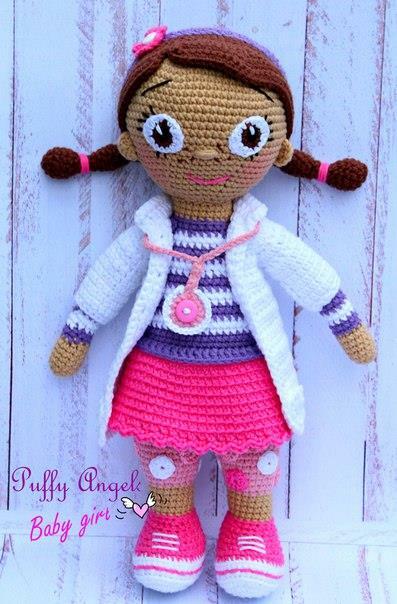 If your daughter dreams to treat patients like Doc McStuffins, she’ll probably fall in love with this crochet doll. The main character of the cartoon Dottie is a very kind and charitable girl. She is always ready to help her plush friends. All the character’s details are designed very precisely, even magical stethoscope. 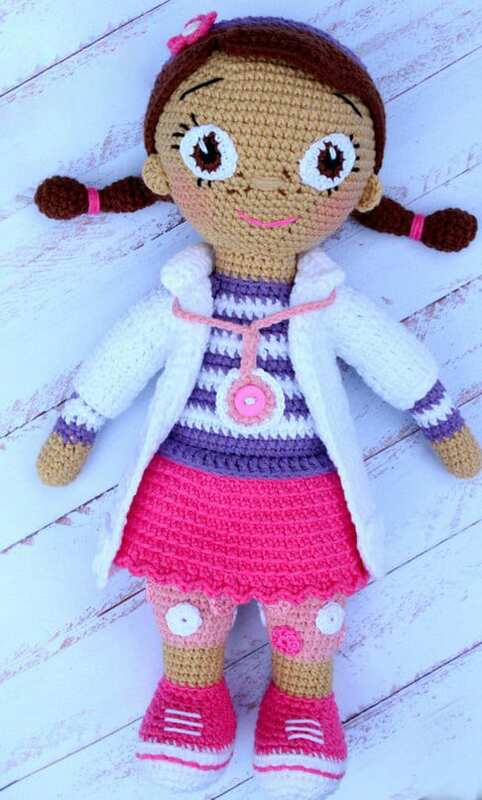 The Doc McStuffins Doll Crochet Pattern is quite complicated, so you need to be patient and have enough time. But the result is worth it! 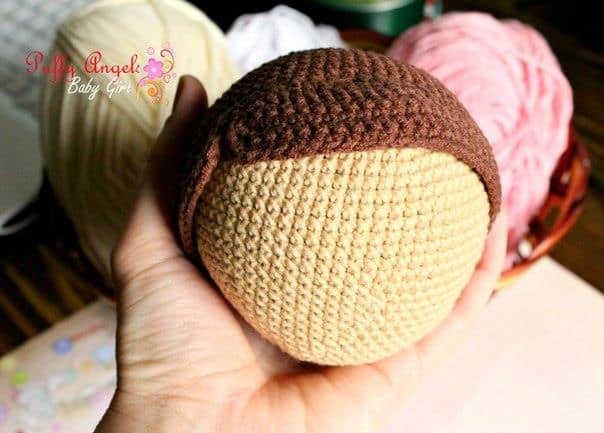 Work with beige yarn. Stuff the head as you go. Now place your stitch marker and continue to crochet the bangs. Work in turning rows: forth and back. For the first part crochet sc in next 26 st, 1 ch for lifting, turn and sc in next 26 st again. Make three more rounds in this way. You will get five rows of the bang as a result. After finishing Row 5 crochet sc along the side of the bang and make 2 sl st into the main hair part, thus separating 2 bangs. Don’t cut the yarn, continue crocheting the second bang (it is larger but consists of 5 rows too): sc in next st, hdc in next st, dc-inc, tr in next 3 st, tr-inc, tr in next 3 st, dc-inc, hdc in next st, sc in next 27 st. Crochet the other four rows with sc. You will have 41 st in each row. Sew the hair to the head. Sew the bangs together at the back side. 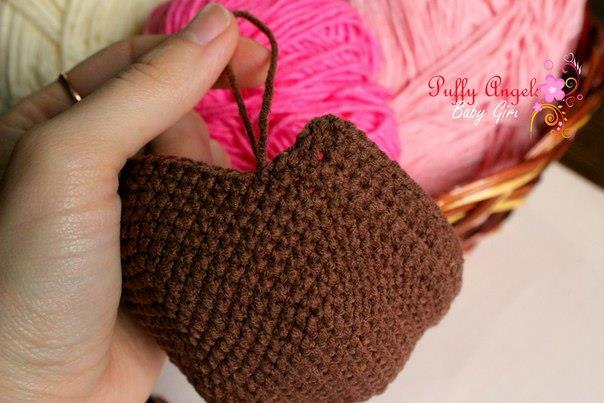 Work with dark brown yarn. Stuff the braid as you go. Sew the braids as in the pictures. Embroider the scrunchies with pink yarn. 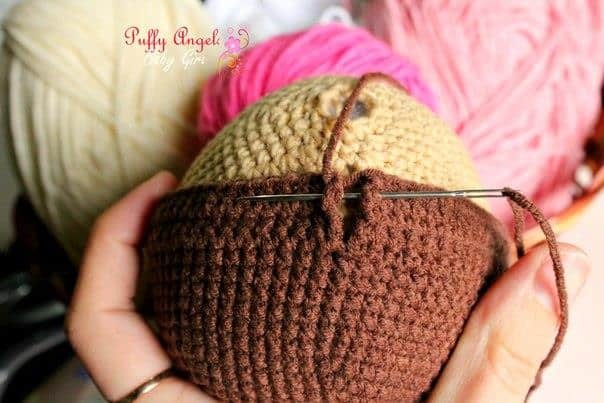 Use a thinner yarn (Yarnart Begonia, 1.2 mm crochet hook) of black, dark brown and white colors. Round 3: sc in next 2 st, hdc-inc, dc-inc, hdc-inc, sc in next 3 st, hdc-inc, dc-inc, hdc-inc, sc in next st.
Sew the eyes on the face. 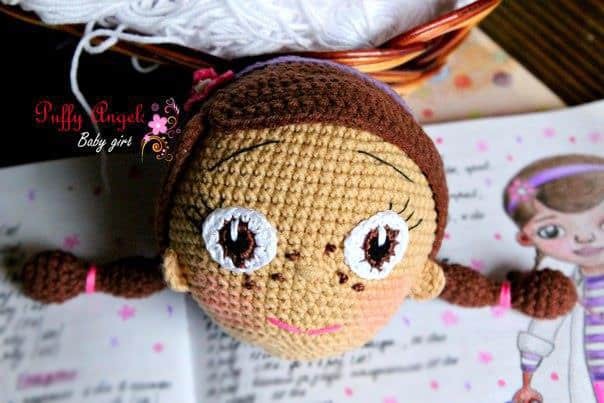 Embroider eyelashes, eyebrows, nose, freckles and mouth. Ears: (3 ch, 3 dc, 3 ch, sl st) all in magic ring. Draw the ring tight, fasten off leaving a tail for sewing. Try it on the head, make more or less chain stitches if it’s needed. Row 2: crochet sc in each ch starting from the second ch. Crochet in a magic ring: (3 ch, dc, 3 ch, sl st) repeat 5 times = 5 petals. Sew the flower to the bandage, decorate it with plastic button. Start with white yarn. 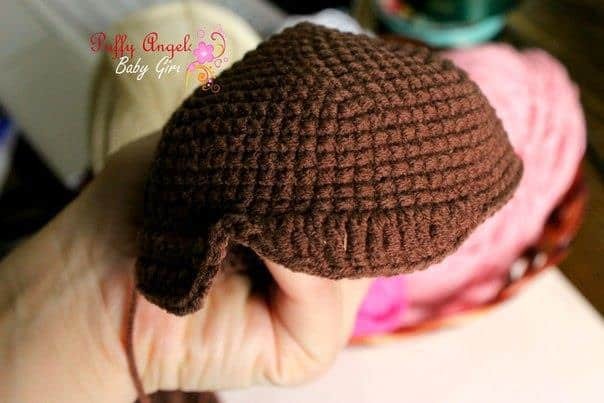 Crochet in the same way as the sole for baby booties. Row 1: 9 ch, inc in second chain from hook, sc in next 6 st, 4 sc in the last st, continue to work on the opposite side of the chain: make sc in next 6 st, inc.
Place the marker and continue crocheting in rounds. Round 2: inc, sc in next st, inc, sc in next 4 st, inc, sc in next st, inc in next 2 st, sc in next st, inc, sc in next 4 st, inc, sc in next st, inc. Round 3: inc in next 2 st, sc in next 2 st, inc, sc in next 5 st, inc, sc in next 2 st, inc in next 3 st, sc in next 2 st, inc, sc in next 5 st, inc, sc in next 2 st, inc.
Fasten off, cut the yarn. Make several circles (9 pieces for each leg) to decorate the leggings: crochet 10 exsc in a magic ring. (Exsc is an extended single crochet, if you don’t know how to crochet it, watch this tutorial on youtube). Fasten off leaving a tail for sewing. Sew all circles to the leggings. 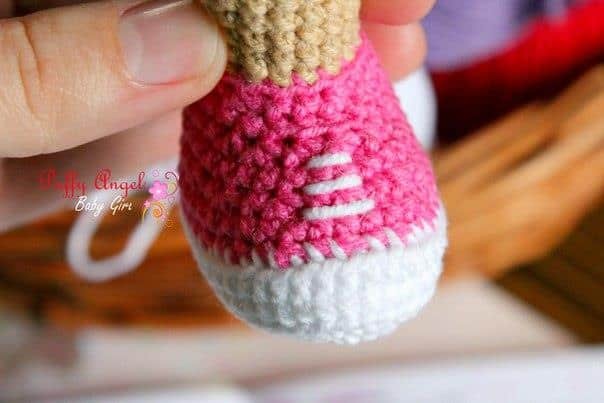 Embroider the shoelaces on the sneakers. Row 1: sc in next 3 loops, turn. Row 2: 1 ch, sc in next 3 st. Fasten off and hide the end. Repeat these steps for the second shoe. Stuff the legs with fiberfill. Join them with 3 sc, place the marker and continue to work in rounds. Start with light pink yarn. Stuff the body as you go. 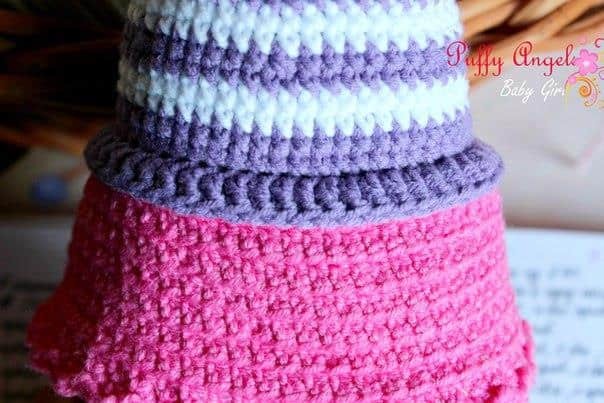 Crochet the following rounds in back loops only using bright pink yarn. Make 2 ch for lifting at the beginning of each round and finish it with sl st. Round 10: *(sc, exsc, sc) – all in the first st, sl st in the second st* repeat from * to * till the end of the round. Fold the edges together, crochet sc through both layers closing the hole. Stuff the arms slightly, especially at the top. Sew them to the body. Work with white yarn in turning rows (forth and back). Crochet 2 ch at the beginning of each row. Row 1: exsc in all 24 st.
Row 2: exsc in next 3 st, 3 exsc in next st, exsc in next 4 st, 3 exsc in next st, exsc in next 6 st, 3 exsc in next st, exsc in next 4 st, 3 exsc in next st, exsc in next 3 st.
Row 3: exsc in next 4 st, 3 exsc in next st, exsc in next 6 st, 3 exsc in next st, exsc in next 8 st, 3 exsc in next st, exsc in next 6 st, 3 exsc in next st, exsc in next 4 st.
Row 4: exsc in next 5 st, 3 exsc in next st, exsc in next 8 st, 3 exsc in next st, exsc in next 10 st, 3 exsc in next st, exsc in next 8 st, 3 exsc in next st, exsc in next 5 st.
Row 5: exsc in next 6 st, 3 exsc in next st, exsc in next 10 st, 3 exsc in next st, exsc in next 12 st, 3 exsc in next st, exsc in next 10 st, 3 exsc in next st, exsc in next 6 st.
Row 6: exsc in next 7 st, 3 exsc in next st, exsc in next 12 st, 3 exsc in next st, exsc in next 14 st, 3 exsc in next st, exsc in next 12 st, 3 exsc in next st, exsc in next 7 st.
Row 7: exsc in next 8 st, 3 exsc in next st, exsc in next 14 st, 3 exsc in next st, exsc in next 16 st, 3 exsc in next st, exsc in next 14 st, 3 exsc in next st, exsc in next 8 st.
Row 8: exsc in 10 st, skip 16 stitches for first sleeve, exsc in next 20 st, skip 16 stitches for the second sleeve, exsc in next 10 st.
Now you have 40 st (front side and back side). Row 9-26: exsc in all 40 st.
Further, crochet the sleeves in rounds. Make 16 exsc for each sleeve. Work around joining with sl st at the end of each round. The number of rows depends on the length you need. Start with light pink yarn. Work in back loops only. Round 4: 1 ch, (inc, sc in next 2 st) repeat 5 times, sc in next st  Don’t crochet till the end of the round. Leave two stitches uncrocheted. 1) Join light pink yarn to the one of two left stitches of Round 3. 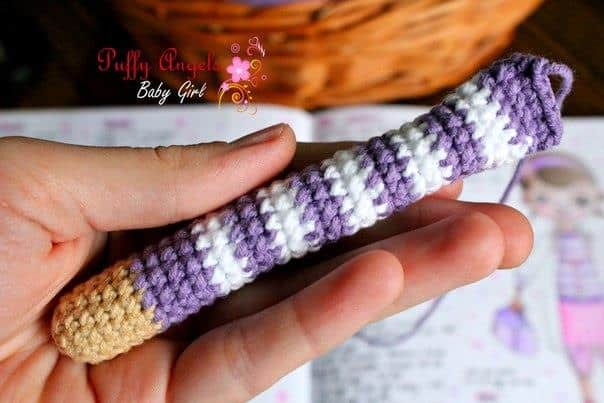 Crochet the chain equal to the length of stethoscope tube. 2) Join light pink yarn to the other of two stitches of Round 3. Crochet sc in next 8 ch of the first tube. Continue to crochet chain stitches (length is equal to the first tube). Decrease till the hole is closed. Sew the earphones to the ends of stethoscope tubes. Sew a pink button to the center of stethoscope. 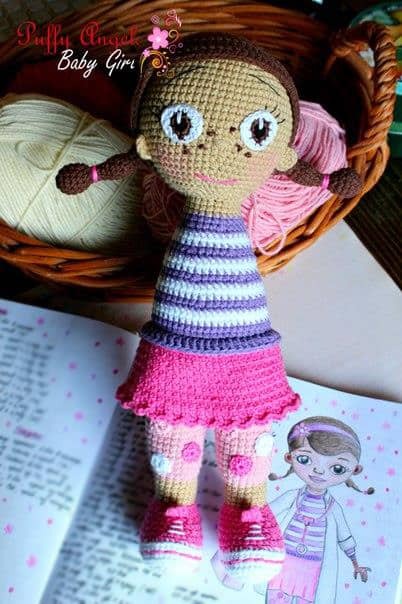 I have completed this doll and it turned out beautifully. You did a wonderful job with this pattern. 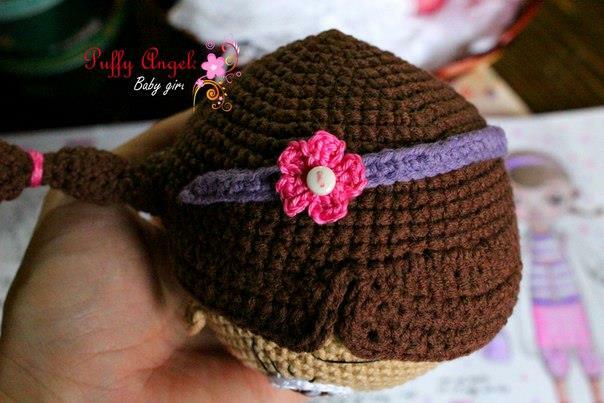 Are you going to be doing patterns for Doc McStuffins’s friends? Tem o restante dos personagens? Can you provide instructions on crocheting the collar to the lab coat. MUCHAS GRACIAS POR COMPARTIR ESTE PATRON , SOBRE TODO QUE ES GRATIS. ES MUY AMABLE DE PARTE. BENDICIONES POR TU TRABAJO. 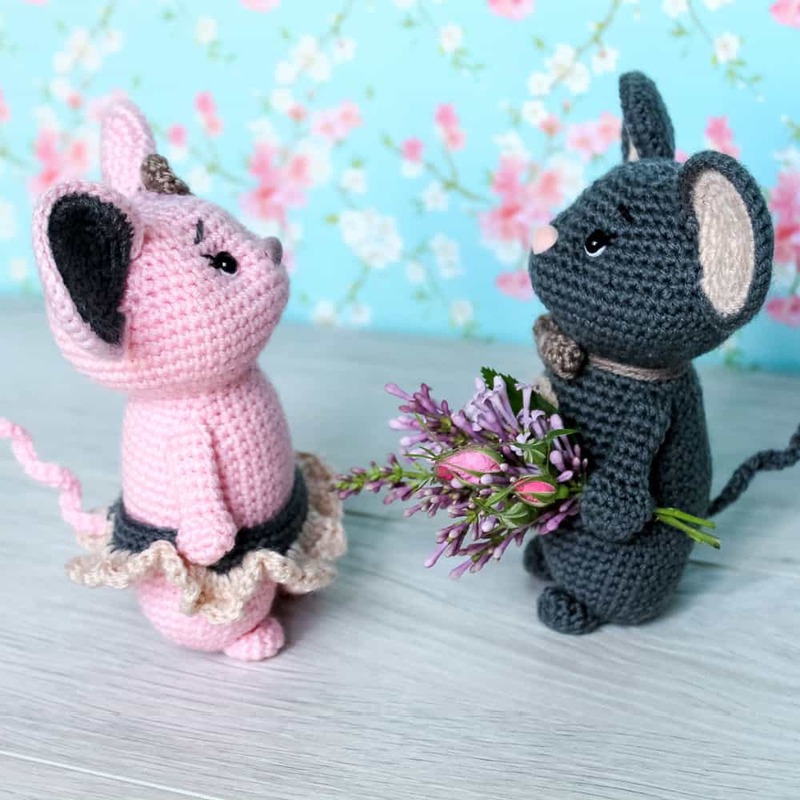 Thank you so much forthe free pattern. It is also easy to follow. One question though can one sell the finished one? thank u so much my dear the work is clear and full of details . thank u again . hi ive been working on this doc mcstuffins doll for the best 4 days and i finally got her done!! i wish i could post a picture of her on here but i cant. thanks so much for the free pattern i love it and so does my daughter. 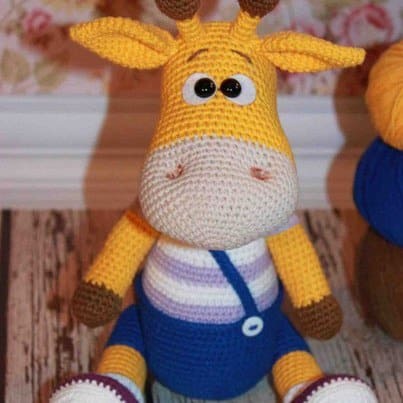 Thank you so much for sharing this amazing pattern…especially for free! Thank you again for sharing. The pattern is written well, and the pictures are great to help follow along. Thank you so very much for this cute doctor! Love it. Going to make my grandkids very happy. Clear desciption! Am having trouble attaching the body to the head. 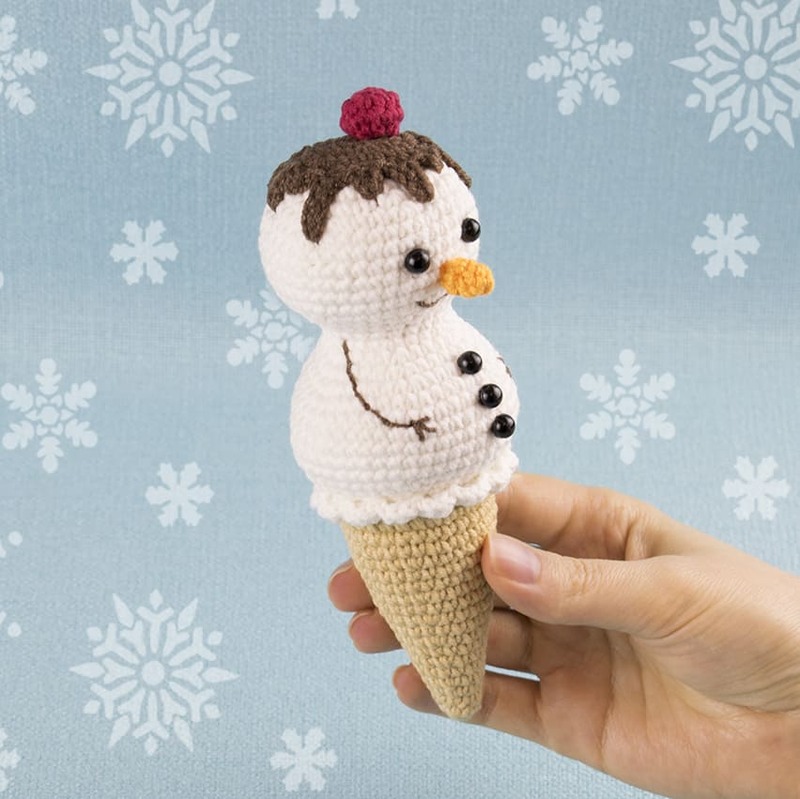 Can you share how to attach the neck to the head please? 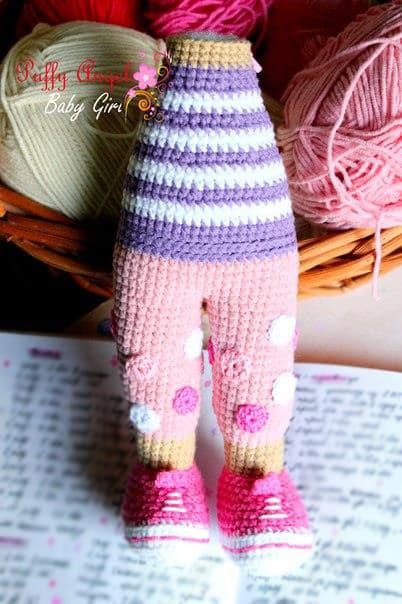 Hi..this doll is adorable..how tall is it?? 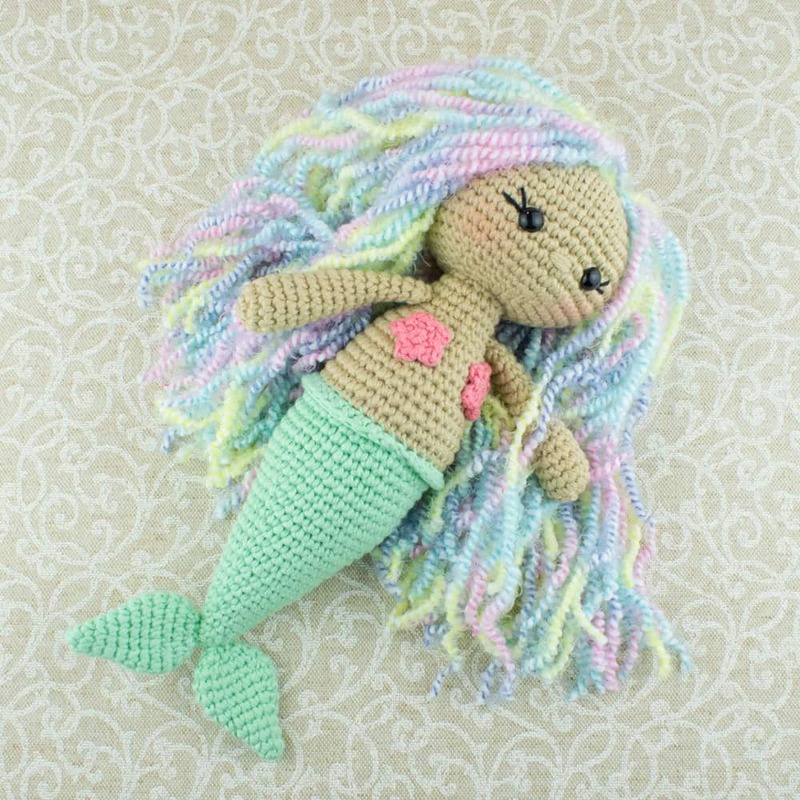 Want to make her and also another modifying the legs into a mermaid tail for my nieces first baby..thanks!!! 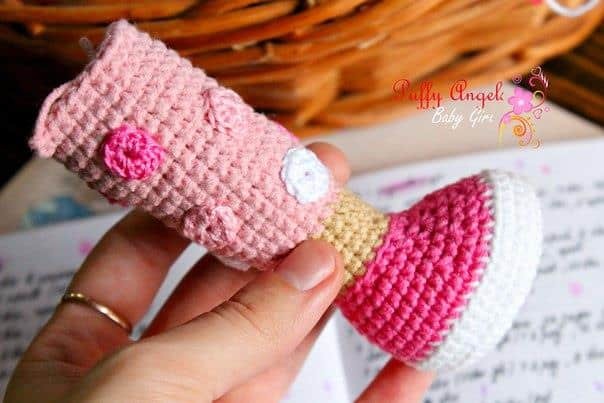 Very nice pattern…thanks very much..
Hi Emy, just crochet sc in next 3 st through the loops of both legs 🙂 You’ll get joining that consists of 3 sc. Dedankt voor deze mooie pop. 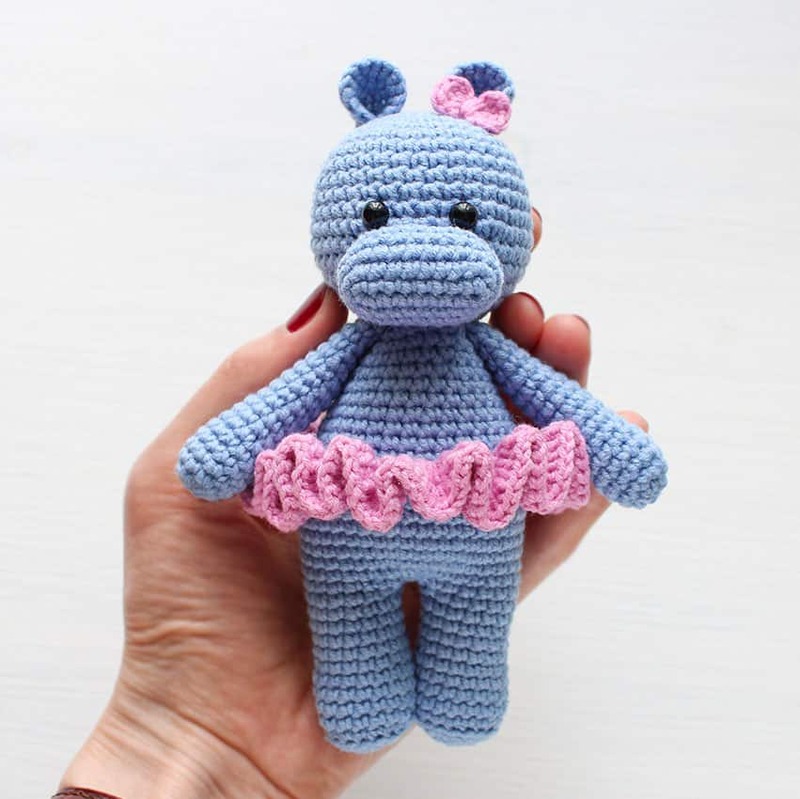 Ik ga ze maken voor mijn jongste dochter en kleindochter. Hebt u mss papronen van Anna en Elza? Ben nu met Olaf bezig. Hi Karine 🙂 We don’t have the patterns for Anna and Elza. Incredible! 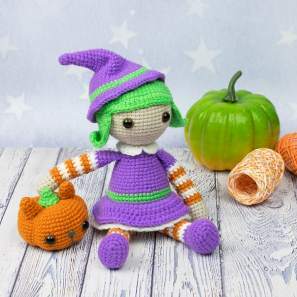 I can’t wait to get started making her for my girls! Do you think it would be possible to make her without the clothes? I was thinking it would be fun to work up different outfits for my girls to dress her in. Thank you for the pattern! Trabalhos lindos . Gostaria de ter aprendido ingles ,mas vou tentar assim mesmo . Obrigada . I can’t get on YouTube, can you print out how to do exsc. I follow printed things better than people telling me how. Maravillosa como tú, muchas gracias…….. When making your coat for Doc McStuffins doll wht do P means in your pattern. Hi Patricia, please see the explanation in Row 2 of the coat. I have a question for u ok. Do we have to use the same type of yarn or is there something that we can substitute for. 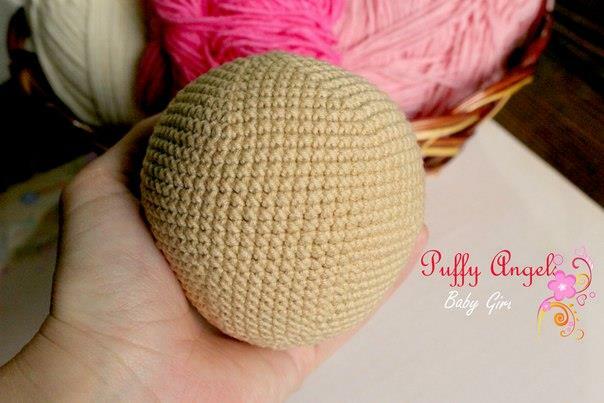 You can use any fine (baby/4ply) semi-cotton or acrylic yarn.